While at Scots College in Wellington, John Mowbray realised that he could turn his own stamp collecting hobby into a money-making business. Fifty years later, he’s still at it! It all began with an advertisement in the Weekly News, offering packets of stamps for a shilling. Under the banner of Capital Stamps, young John was soon selling his packets in local bookshops. Off to Victoria University, the business grew while he studied for a BCA, with stamps imported in bulk from the UK, packeted and sold by mail order and through a growing network of shops. By the time he finished his degree, the business was booming, and it was inevitable that John’s future was heading in the direction of philately; his hobby fast turning into his business. After graduating, John visited Australia and was impressed with the Seven Seas mail order stamp business in Dubbo, NSW, the third biggest employer in the country town. On his return, John set up a postal stamp auction business, and in 1974 outlaid $4,500 on a 1200 sq foot premises in Dunstan Street, modelled on the Seven Seas venture. In his first year his two postal auctions generated $1,100 in turnover, giving John confidence to employ two staff and expand the stamp business. By the end of the year, John Mowbray at the age of 27 had a stamp shop in Otaki, had never had a ‘real’ job working for anyone, and was on the brink of a career that would see him established as a major factor in the world of philately. Turnover in 1975 was $15,000; two years later it had increased three-fold and by 1978 exceeded $120,000. This was a buoyant period for NZ stamps, and John was at the centre of it. John’s belief that he could establish a mail-order company in Otaki was proved correct. His foreign client base was growing, and they were just as happy to buy collectible stamps from a reputable dealer in Otaki as they were from a dealer in London or New York. John flexed his muscles with his first public stamp auction in Turnbull House, Wellington, to complement his mail-order business. He had just completed his 36th mail-order auction, but this was John’s first as a public auctioneer. It netted $22,000 and considerable acclaim. By 1979, turnover had exceeded $250,000, with overseas clientele who were prepared to trade with an auctioneer from Otaki that they’d never met. Best of all, these were the halycon days of Muldoon’s crazy Export Incentives, which one year resulted in a tax refund of $100,000 and may account for John’s liking for fast luxury cars. You can always tell when John Mowbray is at work: just look for the sleek silver Bentley parked outside the shop. By 1980, John had married Jane Galloway from a local farming family, moved to Waikanae and was about to become the first Kiwi to exhibit at the prestigious London Stamp Exhibition, a once in a decade event. This was a huge success and cemented John Mowbray in the world of international philately. In 1983, a leading retired military man, chairman of WWF NZ visited Otaki seeking Mowbray’s help. WWF are an international organisation passionate about conservation, who were exploring stamps as a promotional vehicle. John was persuaded to help, resulting in an agency agreement where Mowbrays would market commemorative WWF postage stamps in Australia & NZ. The results exceeded expectations. With John’s marketing, over 10% of the world’s sales of WWF stamps comes out of the Otaki office, and thirty years later it’s still going strong. John estimates that they have raised over $1 million for WWF to date inNZ & Australia. Coincidentally, Gibbons was born in 1840, the year of the first postage stamp. He would go on to found the world’s leading specialist stamp company, holder of the royal warrant. Stanley Gibbons’ offices are at 399 The Strand, opposite the Savoy Hotel in London. 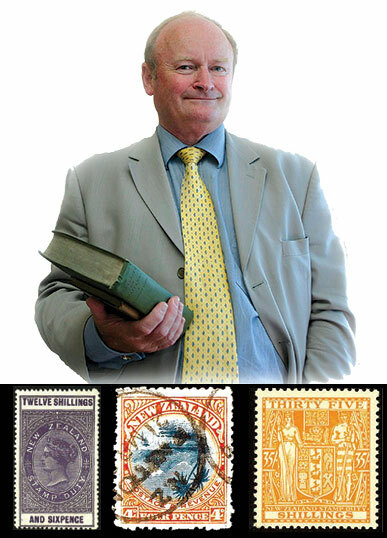 In 1989, entrepreneur and passionate stamp collector Sir Ron Brierley acquired 30% of the company. He appointed his friend John Mowbray to represent him on the board, a position he held for seven years. The experience, being associated with the world’s largest stamp dealers gave John a new perspective, raised his profile and enhanced his reputation amongst the world’s dealers. Mowbrays became licensees, trading under the Stanley Gibbons name in NZ, which they relinquished on becoming a public company in 2000. In 2000 Mowbray Collectables listed on the NZ Stock Exchange. Among its 300 shareholders, you will find the name Ron Brierley, who has a large shareholding. The company has 12.8 million shares, trading at around 50c, giving it a market capitalisation of $6.4 million. Mostly shares are owned by New Zealand collectors, and John reckons he knows most of them. Later acquisitions have included Webbs of Auckland, who are NZ’s largest auction house. Their expertise includes art, jewellery & wine. John sees art as a growth area. Mowbrays have owned Bethunes Books for two decades, which are now part of the Webbs Auckland operation. Rare books remain an interest, although it’s a small specialist market that accounts for two sales annually. In 2001 Mowbrays added numismatics (collections of coins & banknotes) to their portfolio. They are collected worldwide, but less so in NZ. Coins represent 15% of Mowbrays turnover. In the last sale, 515 lots of coins were sold for $272,000, with an average price of $530. John proudly recalls setting a world record of $9,750 for a NZ 1879 pattern penny. In 2005, Mowbrays took a 20% interest in Australian company Bonhams auctioneers. This proved problematic, and was absorbed by Sothebys Australia. Mowbrays have 25% of Sothebys and a seat on the board of the prestigious auction house. John doesn’t discount the possibility of adding another auction house to Mowbray Collectibles activities. The internet has had a significant influence on Mowbray Collectables, although John wryly recalls that his average collector is over sixty, more than likely male and probably not as computer-literate as the average person. Monthly stamp auctions are ‘run by the computer’. Catalogues of stamps are sent electronically around the world, each stamp guaranteed, each stamp with a description and an estimate of sale price. The hard-earned Mowbray reputation and a guarantee of authenticity adds confidence to foreign buyers. Such is Mowbray’s expertise that most stamps in the electronic auctions sell close to their estimate, although in the case of strong competitive bidding, sometimes the estimates are exceeded. More than half the stamps will go overseas, demonstrating once again that it’s possible to run a worldwide business from Otaki. In forty years of trading, John says his sales of stamps have exceeded $60 million. He believes his Otaki operation have been responsible for $40 million in exports. Mowbray Collectibles has a staff of 14, the majority living in Otaki or on the Kapiti Coast. Otaki will continue to be the headquarters of the stamp and coin empire, although John doesn’t rule out further expansion within the fine art business. Outside of collecting, John Mowbray is a keen rugby supporter. Supporting his three sons started his interest, which has extended through the local Waikanae club to chairmanship of Horowhenua-Kapiti, a post that he’s held for a decade. John spent four years as a director of the Hurricanes rugby franchise, which he says was ‘fascinating’. For the last seven years, John has been chairman of the Mahara Gallery Trust. He’s proud of what Mahara has achieved in introducing significant NZ artists to the Kapiti Coast, and giving local artists a chance to exhibit their wares. Mahara will be swept up in changes to Waikanae, which will be challenging, but with strong support from KCDC and the community, John’s excited about the future of the gallery. Currently Mahara has 20,000 visitors annually, half of whom are from outside the district. Aside from WWF stamps, and setting world records for stamps and coin sales, John Mowbray is particularly pleased with the sale for a world record price of $125,000 of the 1903 4d Lake Taupo invert. ‘Invert’ is collector jargon for the image being printed upside-down. John said a whole sheet of these stamps were printed. It was 26 years later that the error was realised. Only one stamp has ever been found (pictured opposite), and the heavy postmarking disguises the inversion. John approached NZ Post with the suggestion that they purchase it, and re-issue it as a commemorative. They duly obliged, but never re-issued. The stamp is now in Te Papa. John’s other triumph was a block of 4 mint (unused) Penny Black (pictured) that he purchased from the Queen’s collection in 2001 for $18,000. He sold them to a local collector for $27,800 and six years later sold them to Stanley Gibbons for $48,000. This month’s postal auction, Mowbray’s 453rd has 3644 lots, all described in jargon that only stamp connoisseurs could understand. Some lots are illustrated, and I can decipher them. The Penny Black, issued in 1840 was the world’s first adhesive postage stamp. It featured Queen Victoria, had a face value of one penny and had no perforations. Estimates range from $25 to $1,750. With few exceptions, the estimates are close to the prices achieved, although some lots sell well above estimate, signifying intense interest and competitive bidding. At the last auction, 25% of the catalogued lots sold, for an average of $83 and an aggregate of $78,000.